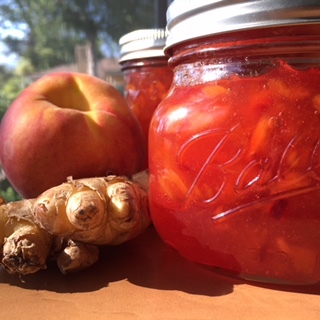 Ginger Peach Jam: Not to be confused with the red headed step child. Peaches are in! It’s this beautiful window of time when you can walk by the display at the grocery and start salivating from the smell. Man… Peaches, like cherries, taste like summer to me. I decided to jazz this recipe up by adding some fresh ginger. The results were a peach perfect combo. 1. Place fruit, ginger and juice in a large heavy bottomed sauce pan over medium high heat. 2. Add pectin and bring to a rolling boil (a boil that continues even when you’re stirring), stir often. 3. Once you’ve reached your boil, add sugar all at once and combine. 4. Bring back up to a rolling boil and let it cook for one minute more. 5. Remove from heat, pour into sterilized jars and screw on lids. Once lids are fastened, flip over and allow to cool lid side down to ensure a good seal. Tip: I pour my jam into a four cup measuring cup. The size and the spout makes it easier to manage when filling the jars. Next Post Tattoos: How to be a trashy female. I’m Diabetic. I made this today using a little Splenda. The fruit its self was already so sweet. It’s beautiful. It’s good!